A rare chandelier by Gerald Thurston for Lightolier, circa 1950s, from the "Carnival Collection". Original cream, black and red shades. This was the American version of Sarfatti. 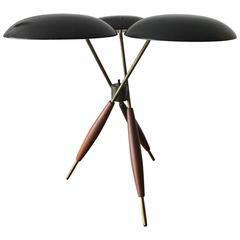 A great Mid-Century lighting example-Gerald Thurston for Lightolier tripod lamp. Very good original condition-original painted shades, Lightolier label, original wiring, etc. An interesting chandelier by Lightolier, circa 1950s. Perforated brass shade, glass reflector with Fresnel prism. Original canopy. Signed with a green label. A unusual Lightolier pendant in brass with porthole cut outs and perforated white metal shade. 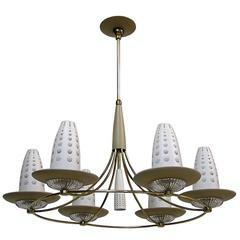 Stunning 1950s Gerald Thurston designed for lightolier brass and glass 5-arm chandelier, in vintage original condition with beautiful patina. Newly rewired and ready to use. 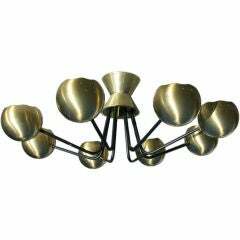 1950s Gerald Thurston for Lightolier brass and glass 5-arm chandelier, the brass have been lightly hand polished. Newly rewired and ready to use. 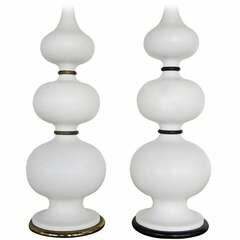 Two chandeliers are available. 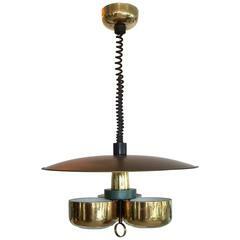 Original 1950s Gerald Thurston for Lightolier chandelier. 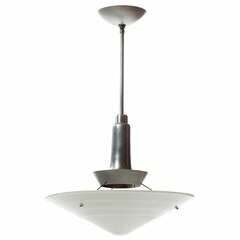 Milk glass dome shade suspends from circular steel central fitting.